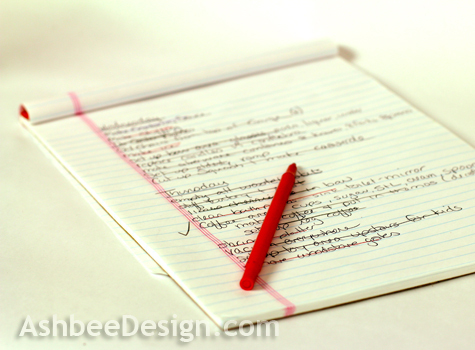 Lists are an obvious solution for just about everything. I have always been a list maker and it is a critical part of holiday entertaining. In addition to shopping lists, menus, and to-do lists I have a shared list. This list appears 2-3 days ahead of a big event and it is placed right on the end of the the kitchen island for all to see. It is the critical game plan for the last 24 hours before the big event. Anyone can add to the list although I do most of it. But everyone helps with completing the chores. We have been doing this long enough now that even my sons-in-laws woke up Thanksgiving morning, made their own breakfasts, cleaned up and went straight to the list. They pick the chore they can do, complete it and then cross it off the list. And then they choose the next thing that interests them. One son-in-law vacuumed the entire house, the other cleaned the upstairs bathroom and always chops anything that needs chopping. My daughters have been working off the list since they were little. It makes the holiday more of a family event when all help in the hosting of the party. The success of the list is that everyone independently chooses what they feel comfortable with. And, it is so very true that many hands make light work. With everyone chipping in, dinner for twenty-one wasn't that big a deal. I am a list-maker and love this concept! What a great way to share the chores that makes everyone feel useful and a part of things. I can't emphasize enough how it has improved family participation and reduced stress. Each time we use it, it gets more effective. Great idea--I'm not sure there are enough hands in my household but it might help my husband and I know what the other is doing so no one feels like they are handling the lion's share of tasks for an event. Other drawback--not sure my husband is a list maker at heart like I am :-). My husband isn't a list maker either, put he is willing to help if I make the list. And he loves the independence of picking the jobs and not having to keep asking for another job to do. If he can see the scope of all that needs to be done, he gladly pitches in. If he feels I am just giving him little jobs to keep him busy, he'd rather work on his projects. It works well for us!